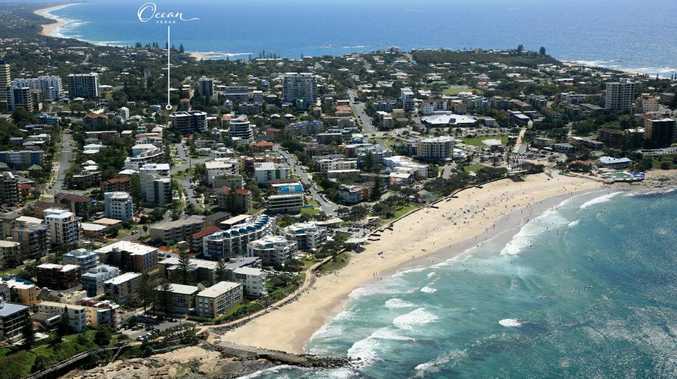 Aerial view over Kings Beach on the Sunshine Coast. A NUT farmer in northern NSW recently got the shock of a lifetime when he was told he'd soon be handed the keys to a luxury beachside apartment for free as a reward for selling his macadamia farm last year. Brian Gittings, 75, said he had been preparing for bed when he received a call from the real estate agency he had used to help sell the farm, who explained that by selling his property he had automatically entered into a draw for a unit in the Sunshine Coast valued at $400,000. "I didn't even notice the competition," Mr Gittings said. "(Winning) was a shock to the system." 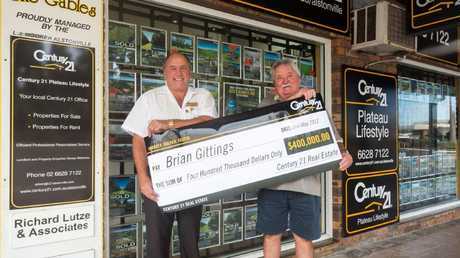 Part of what made the revelation such a surprise for him was that the agency, Century 21, didn't even have his new contact details, Mr Gittings added. "I'd moved house and changed numbers. They must have gone through a lot of effort to find me," he said. 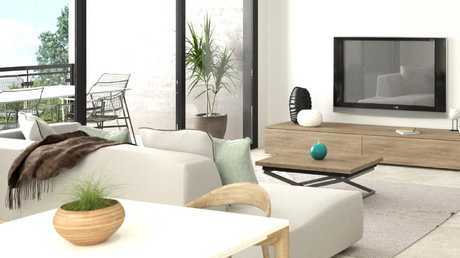 The property is a two-bedroom home near Kings Beach in Caloundra and is part of a seven-level block of 40 units expected to be completed later this year. Brian Gittings (right), with agent Noel Outerbridge. The home was given away with stamp duty costs covered, but the winner could also opt for $400,000 cash instead of the apartment - something Mr Gittings said he preferred. "I don't have much interest in moving to the Sunshine Coast or having an investment property," he said. "The cash will probably be better for us. I can't imagine us doing anything exciting with it, like buying a fast car. We'd just be keeping it." The retiree said he had been reluctant to list his farm in Lindendale, roughly halfway between Lismore and Ballina, because he still enjoyed the farming lifestyle. He and his wife had moved to the area from Artarmon in Sydney more than 20 years ago and had wanted to stay on the farm. It was only when Mr Gittings started finding it increasingly difficult to service the farming equipment that they realised they'd have to move on. The property would have been given away with stamp duty costs covered. Their selling agent Noel Outerbridge of Century 21-Alstonville, himself a macadamia farmer of more than 30 years, said the Gittings had followed in the footsteps of many professionals from Sydney and Brisbane. "Once people come here they don't want to leave," Mr Outerbridge said. "We get a lot of doctors and dentists and those types who come up here to try farming. They usually stay." The competition was national and anyone who had transacted property or sought a market appraisal through Century 21 was eligible to win. "It's was great that the winner was someone in our area," Mr Outebridge said. "It's rare for real estate agents to be left speechless but it was amazing for us." Century 21 chairman Charles Tarbey had explained at the launch of the competition last year that it had been intended to get would-be home buyers and sellers more involved in the property market. "There are thousands of Australians looking to transact property at the moment and we thought this competition may give them an added incentive to explore their options," Mr Tarbey said at the time.